Scroll down to the Staff Management section and click the Manae Staff link. The Staff Search screen will appear. On the top right is the screen menu, click the Add a new Staff member button to simply add a staff member for appointments. This will prompt the Details for new Staff member screen. Enter the staff First name, Surname, select a Location and select the User Level as Staff. 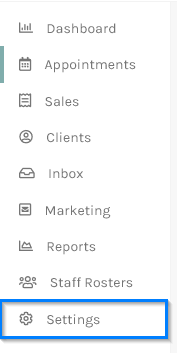 Now, select the services that the staff member performs using the arrows shown below. Then click the Save button below. The Staff Search screen will again appear with your newly added staff member.